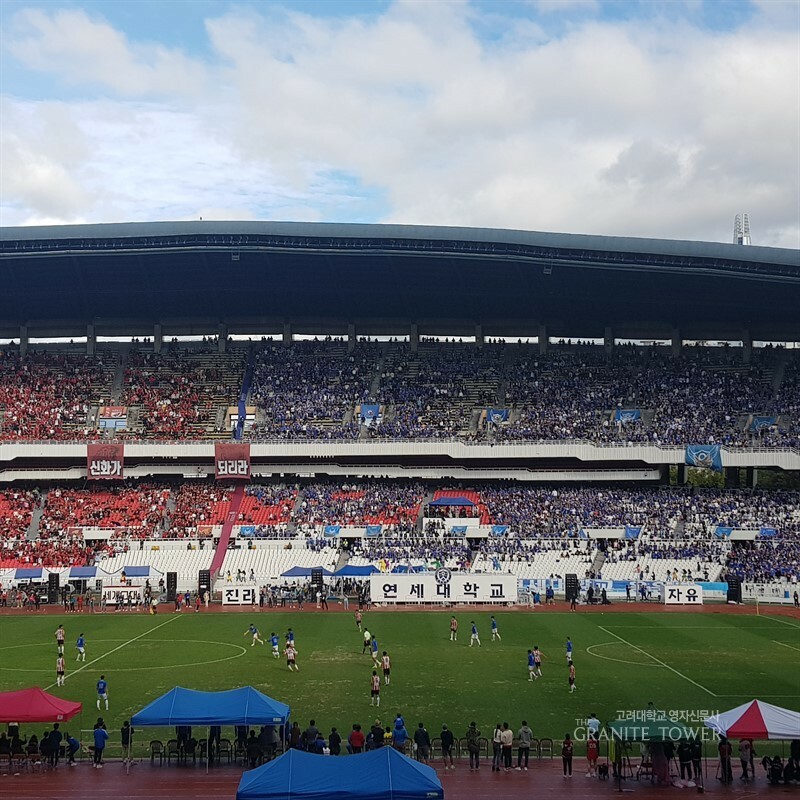 On October 6, second day of the annual Ko-Yon Games, Korea University (KU) lost the soccer match held at the Jamsil Olympic Stadium with Yonsei University (YU) in the score of 1:2. KU Soccer team played in a 4-4-2 formation. Staying with the four back system which was steadily used at the 2018 regular games, they seem to use the formation players are more accustomed with and to enhance the attack. YU played in a 4-2-3-1 formation, using four back system as well. Both KU and YU played more attack based performance than the defense, fierce outdoors games were mostly played from the KU and indoor games of the YU. First half begun with the kickoff from the KU, after the kick, KU players were showing a fierce outside game mostly to the right side based to the KU’s formation. This frequent intense attacks finally made an effort of shooting a goal quickly at 03’21” by Shin Jae Won ('17, Physical Education, FW), scoring 1:0. There were several attempts of the Yonsei players trying to attack directly to the center and were dicey moments of the corner kick, yet, those moments were fended by Min Sung Jun ('18, Physical Education, GK). Second half begun with the rough physical combat from Park Sang Hyeok ('17, Physical Education, MF) and Yonsei’s Lee Jong Mun ('17, YU, MF), showing that Yonsei seems to be anxious about the score, much aggressive movements including tackling and fouls were frequent seen. This aggressiveness finally resulted a goal from Yoon Tae Woong ('18, YU, FW) assisted by Ha Seung-un ('17, YU, MF)’s left cross, making a tie—1:1. Second half seems to reveal KU’s weak point of defense. YU had a strong four back defense and the goalkeeper Kim Si Hoon (YU, GK) when KU players had the ball, however, when Yonsei’s players dashed to the KU’s court, there were only two defenses, Lee Da Won ('15, Physical Education, DF) and Lyu Seung Pyo (Physical Education, DF) the goalkeeper to block the Yonsei’s attack. This lead to another turn around goal from the Yonsei by Ha ('17, YU, MF) scoring 1:2. Dicey moment would have decreased if the KU were more focused on the defense. Tight defense formation could have lead to the better defense and increased ball possession rate. One hopes to see the KU’s intense outdoor games and tighter defense next year.